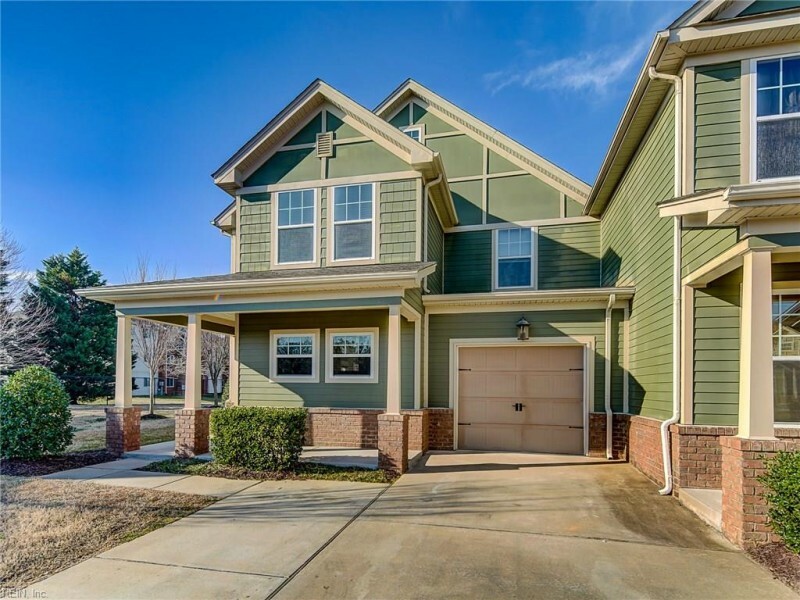 REMODELED CRAFTSMAN STYLE END UNIT WITH 1ST FLOOR MASTER SUITE WITH WALK IN CLOSET, BATH WITH DOUBLE VANITY, LARGE SHOWER & SECOND FLOOR MASTER WITH CATHEDRAL CEILING, SITTING AREA, WALK IN CLOSET & ATTACHED BATH. THIS HOME HAS 4 LARGE BEDROOMS PLUS LOFT AREA ALL WITH NEW CARPET, FANS, FIXTURES & FRESH PAINT. DOWNSTAIRS GREAT ROOM WITH HIGH CEILING, DINING & FOYER HAVE NEW SCRATCH RESISTANT LAMINATE FLOORS, FIXTURES & FRESH PAINT. COOKS WILL ENJOY THE SPACIOUS KITCHEN WITH CHERRY CABINETS, STAINLESS APPL., TILE FLOOR, PANTRY & RECESSED LIGHTS. RELAX ON THE PATIO WITH LARGE SIDE YARD & LAKE VIEWS. THE ONE CAR GARAGE HAS A DOOR OPENER, BUT 2 DRIVEWAY SPACES FOR PARKING & PLENTY OF EXTRA GUEST PARKING. THIS HOME LOOKS GREAT WITH NO EXTERIOR MAINTENANCE OR YARD WORK AND READY TO MOVE IN. GREAT LITTLE NEIGHBORHOOD CLOSE TO SHOPPING, SCHOOLS & HOSPITAL. Ready to visit 258 Craftsman? Request a free property tour! Send me more information about the listing at 258 Craftsman, Suffolk, VA 23434, MLS# 10239687. This 4 bedroom, 3 bathroom home located at 258 Craftsman, Suffolk, VA 23434 has approximately 2,128 square feet. It is currently listed for $215,000 and has a price per sqft of $10,103. This home is currently Sold under the MLS#: 10239687. This listing is provided by Rose & Womble Realty Company. 258 Craftsman Circle, Suffolk was built in 2011. It has Garage Att 1 Car, 2 Space, Driveway Spc parking.The kitchen includes Dishwasher, Disposal, Dryer Hookup, Microwave, Elec Range, Refrigerator, Washer Hookup. 258 Craftsman is part of the Kensington Park neighborhood located in 23434.